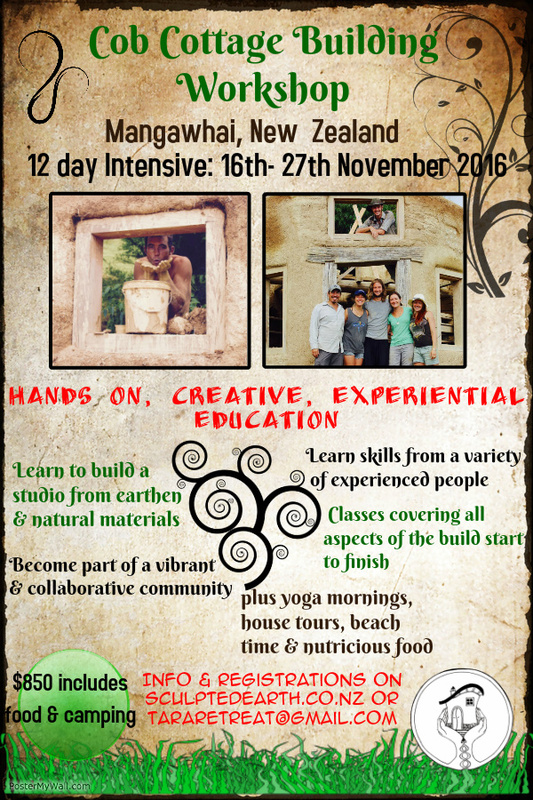 12 DAY INTENSIVE, MANGAWHAI. 16-27TH NOVEMBER ’16. HOSTED AND BUILDING AT TARA RETREAT! Nic, Glen, Riley and Matisse are very excited and honoured to be hosting one of Rosa Henderson’s natural building workshops at their place in Mangawhai and say it fits beautifully with their goals of community building, and living in a more connected and harmonious way. Rosa is an innovative, passionate and experienced natural builder and has constructed a variety of earth and natural buildings all around the world. She has assembled a dedicated crew and the team is not only technologically skilled, but are also great educators and they love to impart their knowledge so course participants can leave empowered with the skills they need to make their own earth buildings. How cool is that! OUR BUILDING – We will be working on a 10sqm cob studio, taking it from the foundations up. Learning will be a combination of classes and hands on experience, as we grow this building out of the ground. You don’t need to have prior experience, but a willingness to do physical work, learn, collaborate, get dirty and have fun. OUR COMMUNITY – There will be places for 12 students, which gives us an amazing opportunity to share knowledge, our own personal stories, our dreams, desires and questions. We will be cooking and living onsite (tenting), and working together every day. Come and be part of our colorful cast of characters! TIMING – There will be a course schedule and time table set for our time together. It will include work hours, class time (demonstrations and talks), evening power points and of course time to relax. We will start November 16th and finishing 27th.